Paula McCullen: Breasts too large, Richard? Every female character you create has breasts too large. Richard Babson: Mmm... but I make them suffer for it. "Best Friends" is a nice film for a weekend afternoon. It is entertaining, has an easy-to-follow storyline, and shows some respect for the viewer. 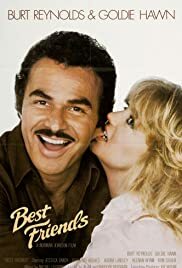 Burt Reynolds and Goldie Hawn are quite appealing in the leads, but so is the supporting cast, which includes Barnard Hughes, Jessica Tandy, Keenan Wynn, and Audra Lindley (best known as Mrs. Roper on "Three's Company"). Though a comedy, "Best Friends" has, alas, very few laugh-out-loud moments, and is almost too casual in pace for its own good. The near-classic wedding scene (with Richard Libertini) offers perhaps the most genuine laughs, although Reynolds, a very underrated comedic actor, adds some subtle bits of his own throughout the movie. "Best Friends" is a competently-made and sometimes touching film that also lacks drive and usually fails to produce much more than an occasional smile. But it's worth a look, to be sure.